The mass-shooting at Marjory Stoneman Douglas High School in Parkland, Florida is different than every mass-shooting that has come before. The vicious cycle of: shock and horror ➡️ thoughts and prayers ➡️ "not the time to talk about gun safety" ➡️ next big news story ➡️ nation moves on has finally been broken. The nation owes a debt of gratitude to these incredibly courageous students who would not allow thoughts and prayers to overwhelm policy and action. But their courage has also made them targets of vicious, lying gun supporters who are trying to tear them down. This petition is to show the students we stand with them. Please add a personal comment to encourage them to continue, and tell them what you will do to assist their cause. The students of Marjory Stoneman Douglas have taken a strong stand - so members of our nation's rabid gun culture have tried desperately to silence them or weaken their messages. These cowards have attacked the students as stooges of "left wing groups with an agenda." They've tried to tie the students' work to the liberal boogieman George Soros. They've called them fake, "crisis actors." 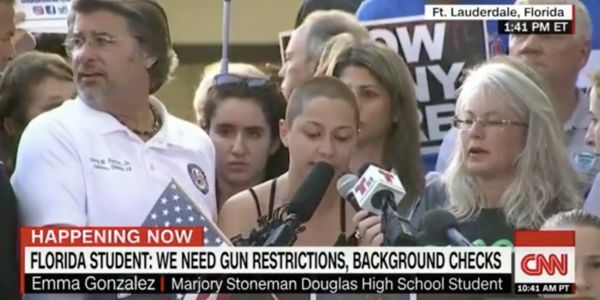 These thoughtless defenders of unchecked 2nd amendment rights have launched a lunatic conspiracy theory that the FBI is behind the students' advocacy to cover up the fact that the FBI didn't adequately act in response to a tip about the Parkland high school murderer. This crazy theory was even "liked" by Donald Trump Jr. on Twitter. As these students are attacked, it's important that they know that we have their back. Please sign this petition to show your support and add an encouraging comment and tell the students what you will do to support their efforts for more responsible gun laws. These students have demanded that now IS the time to talk about gun safety. Within a week of the shooting, these students have already taken to the state capital to urge action, and are doing so much more.They are speaking to the media, planning marches, and inspiring action all around the country with their chants of "never again," "we call B.S." and "vote them out"
Thank you. Standing together, we can make our schools and our communities safer.